There are three things you need to know about me, aside from my about page. One, I love coffee, which you probably already knew. Two, I love to read, which you might not have known. And three, I love, absolutely adore, Harry Potter. As a matter of fact, back in 2010, I read listened on audio to nothing else but Harry Potter. All seven books on rotation. For a year. Some people might think that is crazy, but honestly, it's not. When I had an office job we were allowed to have our headphones on pretty much all the time. Instead of listening to music, I listened to books. 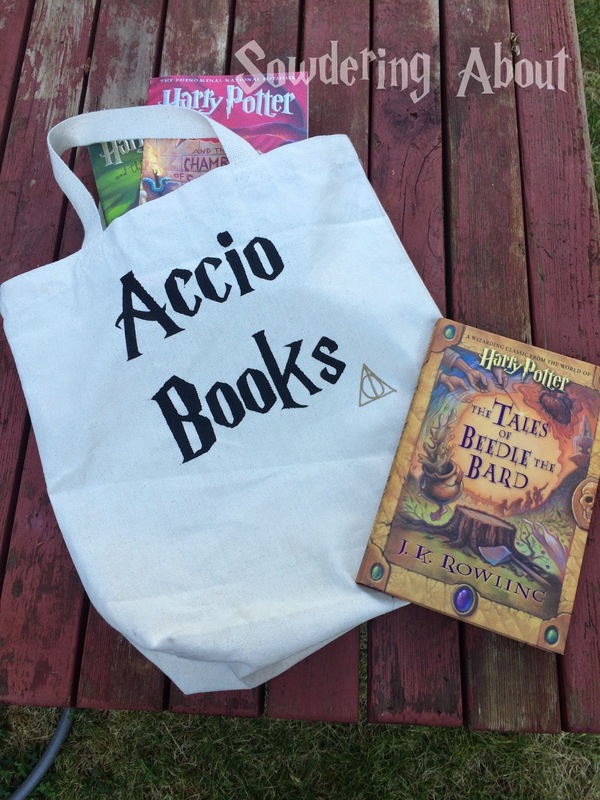 The magic of books is that they can just take you away to far off places and when you are working in an accounting office, there is no better place to be than at Hogwarts. Of course every good tattoo deserves a good story right? Well this one is on my left forearm. I also have Lucy's name in braille on my wrist (because she is half blind) and a pair of glasses from Dexter's Laboratory since Matt wanted to name him after the boy genius. 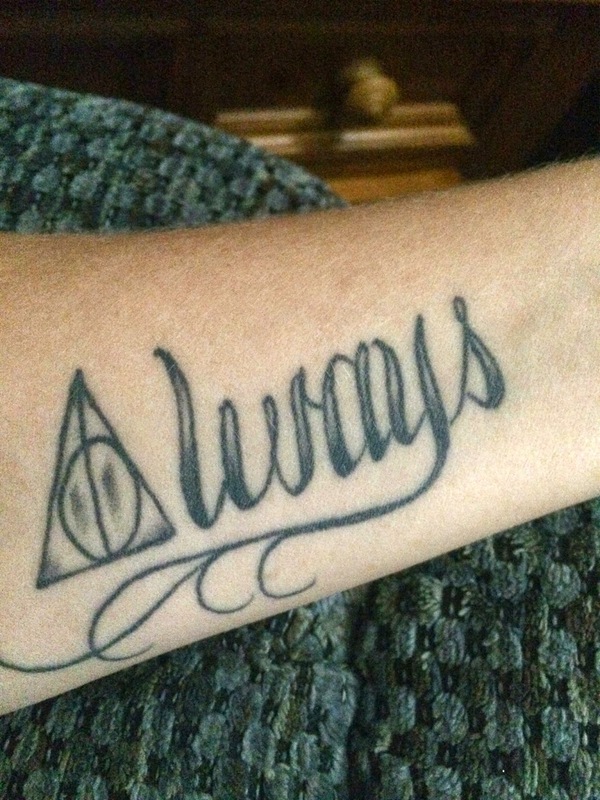 I decided to get the "Always" done on the same arm because my left arm is the arm that I carry my babies with. When they are too big to be carried, I will still be able to carry them with me...after all this time. 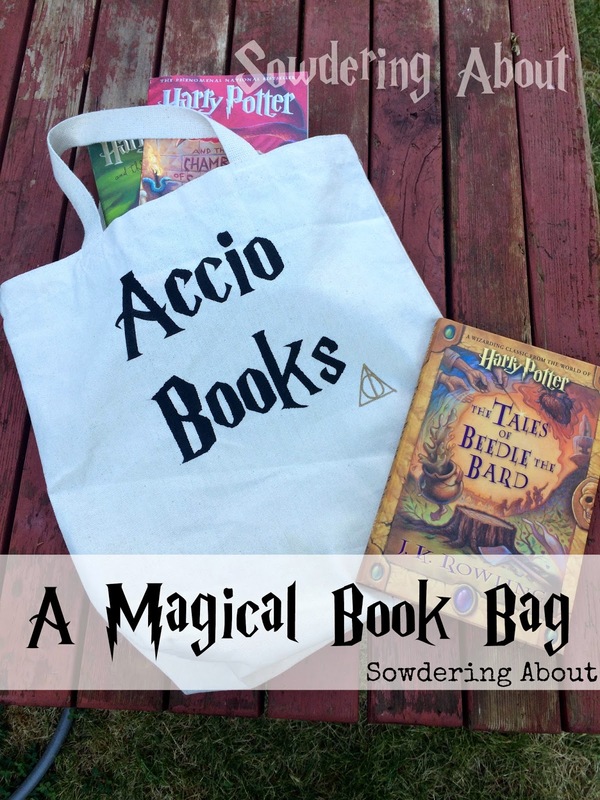 This summer, when the kids and I started visiting the library, I knew they needed something better than just a bag to carry their books home with them. I had been wanting to make a book bag like this for years now so this was a great excuse! 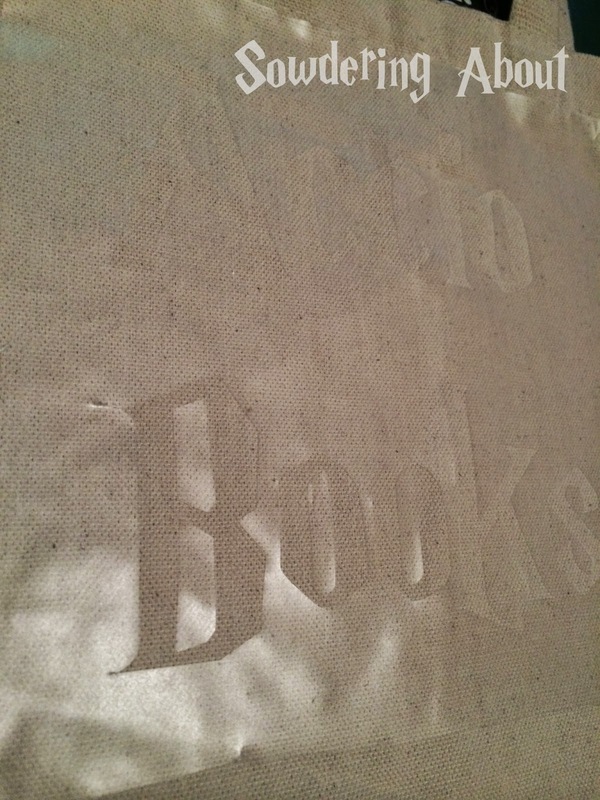 I downloaded the Harry Potter font from dafont.com (who am I kidding, I've had it downloaded for years) and I cut out my letters on contact paper using my Silhouette. A lot of people use freezer paper, but I haven't used it before, and I didn't have any, so I just stuck to what I know which is contact paper. Contact paper isn't difficult to use, but it can be kind of finicky so you just have to be gentle with it. When the Silhouette was done cutting, I carefully removed it and stuck it on my bag. I carefully added the centers to the "b" and the "o's" using an X-acto blade. I then used a black fabric paint to paint on the words. To set the paint, I used my blow dryer on high heat. This isn't necessary, but I was in too much of a hurry to see my end result so I couldn't wait for it to dry on it's own. When the paint was dry, I gave it a good hard look, it was kind of plain, I decided it needed a "Deathly Hallows" symbol as well, so I drew it on with a gold paint pen. 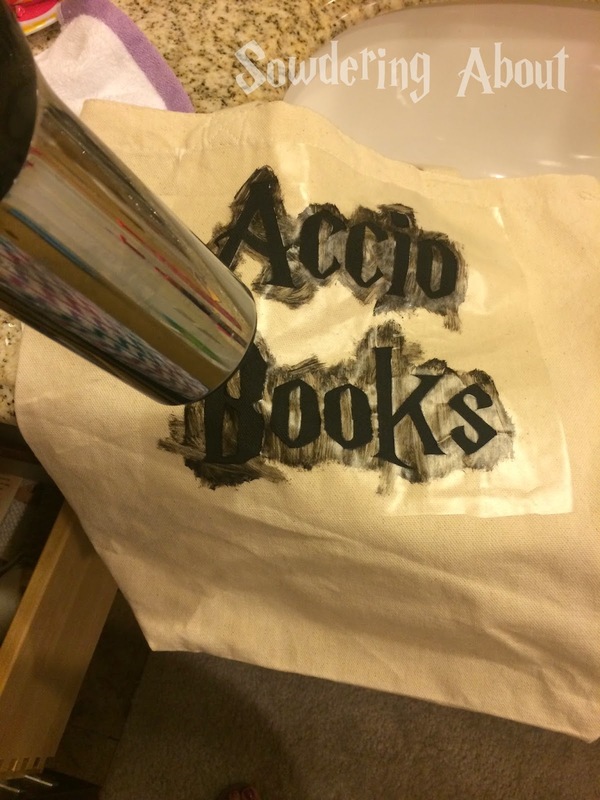 It was the finishing touch that this bag needed. The only problem that I have with this bag now is, do I give it to the kids or keep it for myself?